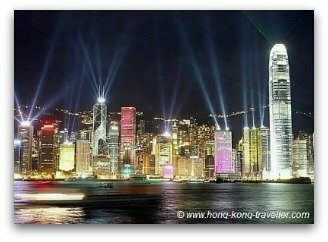 There are the classic Hong Kong Landmarks like the Star Ferry and Victoria Peak, as well as the newcomers Hong Kong Disneyland which is great fun for little kids or the Sky100 Observation Deck in Hong Kong's tallest building and newest addition to the Hong Kong skyline, the ICC tower. 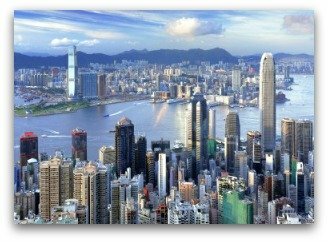 So here is a rundown of our top Hong Kong Tourist Attractions as well as the many landmarks that characterize the city. How best to see them all? 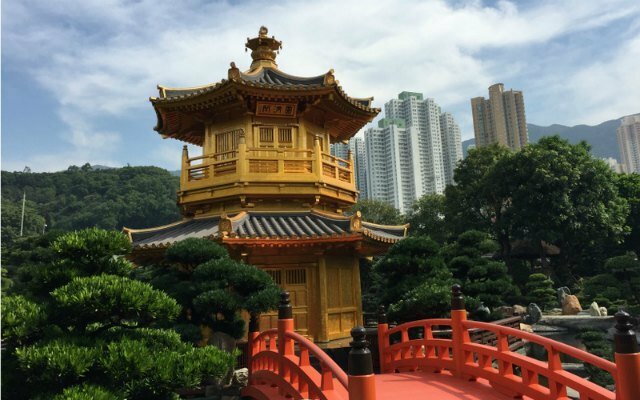 Check out our Getting Oriented page, which gives you an idea of what is where and how to plan your day, and our Sightseeing Guide for the many tips on getting around and enjoying the best Hong Kong has to offer. 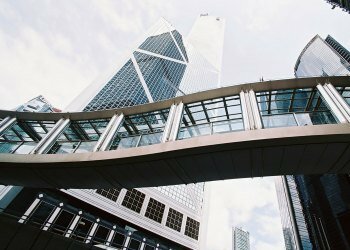 And here's a quick-link list in alphabetical order of all Hong Kong Attractions, Landmarks and Things To Do covered in our site to date. Always bustling with activity, the harbour must be experienced during the day and at night. Victoria Peak is Hong Kong Island's highest point and a landmark of the Hong Kong skyline. 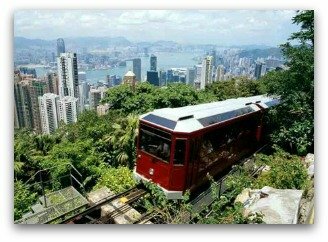 The attraction, however, is not the peak itself, but the breathtaking views of the Harbour from a variety of viewing platforms and the fun way to get to the summit: the Peak Tram. What we refer to as "the Peak" is actually an entire complex including restaurants, shops, viewing terraces, and even a Madame Tussaud's Wax Museum. The Star Ferry is a Hong Kong institution, you haven't "done" Hong Kong without a ride on the Star Ferry. 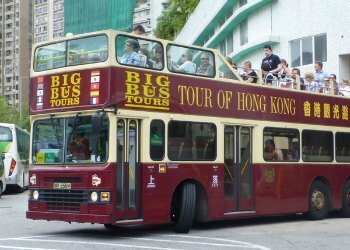 The unmistakable green and white double-deckers have been shuttling residents between Hong Kong Island and Kowloon in the mainland for over 120 years. Up to 1978 when the Cross-Harbour Tunnel opened, it was the only way to cross the harbour. 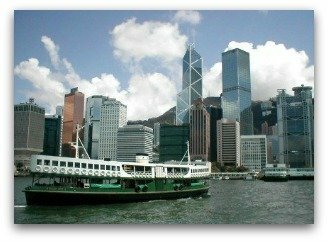 This beloved icon of the city is a lot more than just a means of transportation, for tourists, it is a real sightseeing bargain, a one-way fare on the Star Ferry will set you back HK$2.50, about US$0.35, and offer spectacular views of Victoria Harbour and the Hong Kong skyline. 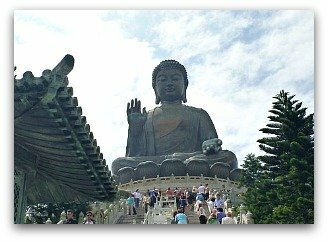 The Hong Kong Big Buddha in Lantau Island is one of the largest seated Buddha statues in the world. Tian Tan, as it is also known, is made of bronze and sits atop the Ngong Ping Plateau. Getting to Tian Tan with the Ngong Ping 360 Cable Car, in itself an attraction, is definitely the recommended way to get there as this 20-minute ride takes you over some of Lantau island's most beautiful scenery. Nearby, the Ngong Ping Village is well appointed with modern facilities and serves as the central point and transportation hub for the many highlights and tourist attractions in the area which can be combined during your visit, such as the Po Lin Monastery and the Tai O Fishing Village. Hong Kong Markets are colorful and lively, a photographer's paradise and a great place to people watch, sample some local foods, catch a few bargains, or simply soak some of the local flavour as this is still pretty much a part of every day life in Hong Kong. 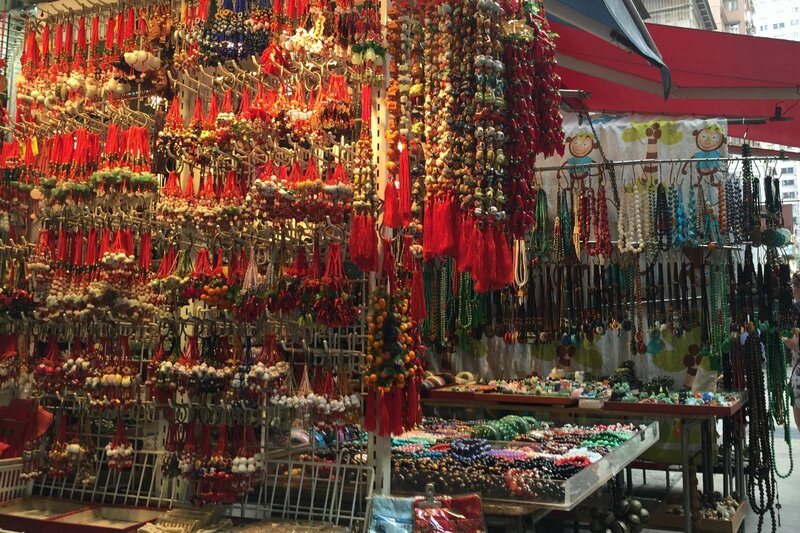 Try to visit at least one market during your stay, chances are, there will be one just around the corner. 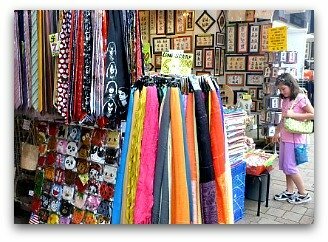 The Mongkok Market Walk: The Flower Market, Bird Garden, Goldfish Market, Jade Market, Ladies Market, etc. 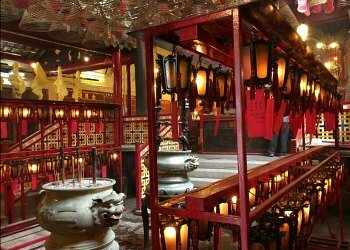 Sheung Wan Walk: Dried Seafood Market, Cat Street, Hollywood Road Antique Curios, and an Ancient Temple. 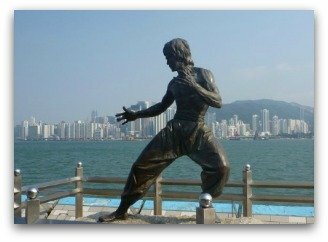 The Avenue of the Stars and the Tsim Sha Tsui Promenade run along the tip of Kowloon's waterfront and is one of Hong Kong's most spectacular walks. 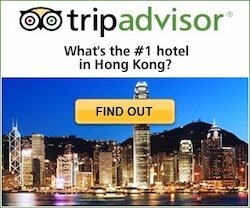 It offers some of the most breathtaking views of the Hong Kong skyline and bustling Victoria Harbour. It is a great place to unwind after a day of sightseeing, just sit outside and relax, grab a bite, people watch, enjoy the sweeping views... or take in the daily Symphony of Lights evening free show. 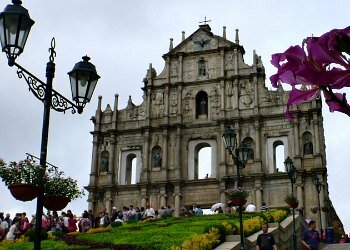 Along the walkway there are cafes and eateries, benches to relax and some of the Kowloon side's greatest landmarks, such as the Tsim Sha Tsui Clocktower and the Hong Kong Museum of Art. The Avenue of Stars is a tribute to Hong Kong's movie icons and is the territory's answer to Hollywood's Walk of Fame. Yes, FOOD is its own attraction in Hong Kong. 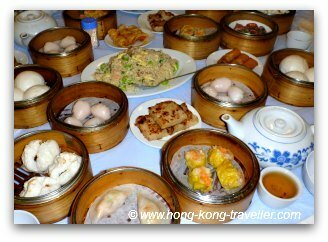 Dim Sum brunches, seafood villages, Dai Pai Dongs, floating restaurants... from Michelin Stars to street food stalls... Food is serious business in Hong Kong... There are flavors and budgets for all. Hong Kong's pride and joy is of course Cantonese food. So what should you try? Here's a guide to some of our favourite Hong Kong foods and food experiences you shouldn't miss. This is Hong Kong's Light and Sound Show, a tribute to the city and its people, their diversity, energy and vitality. This is a free show offered by the city and it takes place every night at 8:00 p.m.. It lasts about 15 minutes. The light show involves some forty buildings on both sides of the harbour, with most of the prominent buildings featuring in the show. The lights and beams go in synch with the music (most of the time) but it really depends on where you are whether you will hear the music and narrative. So focus and what interests you the most first, then pick a few more to round up your stay. 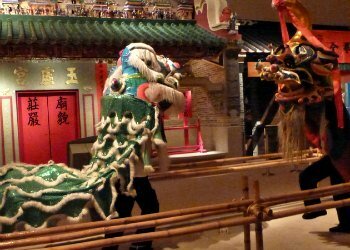 Here are some more popular Hong Kong tourist attractions, some must-do's if you're traveling with children, and some great options for after-hours entertainment as well. The quaint and charming Aberdeen Fishing Village is not far from the hustle and bustle of the heart of Hong Kong, but seems like light-years away from it all, at first look. Here you see rows upon rows of the old-fashioned junks and sampans, some house boats where the fishermen and their families still live, (at least for some 9 months of the year) all going on their daily routines, which now include mobile phones and satellite dishes. It is a very picturesque scene, with the unexpected touch of modernity right and left. Best way to catch all the action is with a sampan ride. 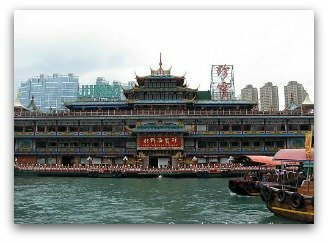 You can also walk along the promenade where you find a colorful seafood market, and don't miss the grand floating restaurants, also a Hong Kong trademark. Come say "Ni Hao" to Mickey, Minnie, Goofy and the Gang! Hong Kong Disneyland is the smallest of the Disney Parks, and even though the selection of rides and attractions is limited (although growing) there are plenty of magical moments to be had at the land of Mouse. The small size of the park and family-friendly set up makes it a perfect place to spend the day with small children. Particularly for toddlers and children under 10, the park will be a very magical experience, whether it is your first time at a Disney park or a repeat visitor. 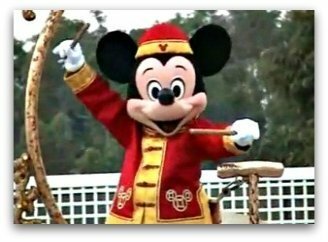 There is the familiar Disney perks: the parade, the fireworks, meeting Mickey and Friends... In our Complete Guide you learn about the different lands and most popular rides, on our Tips for Visiting, we tell you about where to buy discount tickets and how to skip the lines at the popular rides. 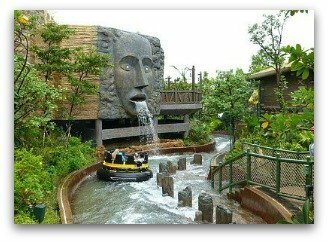 Ocean Park Hong Kong has transitioned from "a good place for a day out" of the city to a truly "don't miss" attraction in Hong Kong, specially with the kids. As the name suggests, marine life is a big part of it, but beyond the wonderful sea life exhibits including a world-class Aquarium and one-of-a-kind exhibits like the Chinese Sturgeon tunnel, Ocean Park has also branched out to include other rare and endangered animals like Giant Pandas and Red Pandas. To round up the entertainment, Ocean Park also offers an array of shows, rides and roller coasters, which offer a great alternative to Disneyland for older children and teenagers. There is truly something for everyone in the family. 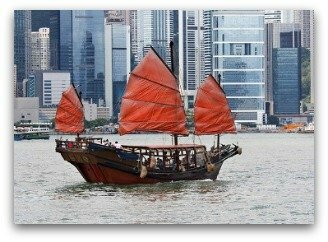 There aren't that many traditional sampans in operation any more, so if you happen to see the red-sail sampans traversing the waters of the bay, it will more than likely be either the Duk Ling or the Aqua Luna. 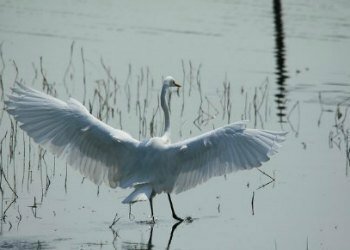 It is now easier than ever to ride on one of this traditional vessels with Duk Ling and Aqua Luna offering regularly scheduled trips on a daily basis. Here are some tips and guidelines to help you plan your junk ride. The beautiful horses, the skillful jockeys ,the crowds going wild, they all add up to an exciting, fun-filled, thrilling atmosphere in a world-class venue. Horse racing in Hong Kong is serious stuff and a major part of the Hong Kong economy and culture. Happy Valley is a world-class state-of-the-art racing course. In the early days, it was not more than swamp land, but the only flat surface in Hong Kong Island, so that was the location of the racing course by default. Through the years, the city has built around the Happy Valley race course, and it is now practically surrounded by skyscrapers. That is indeed a sight in itself, specially at night when the city is illuminated. Exclusive offer for overseas visitors: Horse Racing at the Hong Kong Jockey Club: It gives you access to the Members' Enclosure, dinner at the prestigious Hong Kong Jockey Club, and a tour of the parade ring and winning post. 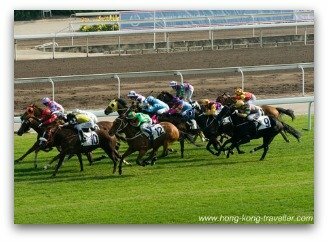 The Happy Valley Wednesday Horse Races Crawl - Hong Kong's ultimate night of horse races and bar hopping! Stop by for a drink or one of the ostentatious 9-course meals... with prices to match of course but a real treat with stupendous views of the harbour. 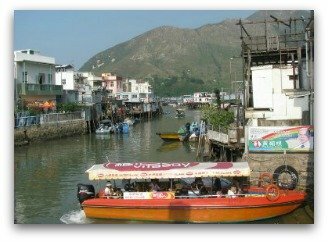 The Tai O Fishing Village in the Western coast of Lantau Island is a quaint and picturesque enclave in a pretty setting on the coast framed by the mountains. There's much activity surrounding the harbour, the traditional seafood market and the daily routines in the stilt houses, a photographers dream and definitely worth the trip. If you are already visiting the Big Buddha, then it is a short bus or taxi ride, about 15 minutes. 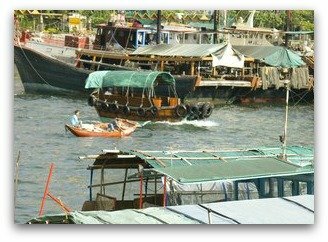 You can easily spend a couple of hours just walking around the market and taking one of the little boats to explore around the harbour and the stilt houses for a close up view and perhaps catch a glimpse of the elusive Pink Dolphins. Feng Shui Class - FREE!